Adventure Center travelers navigate the diverse landscape of Southern Africa, from South Africa to Namibia, Botswana and Zimbabwe on its 22-Day “Deserts, Rivers & Wildlife” small-group tour – and give back to the African community while they do it. For each booking made before Oct. 31 on any of Adventure Center’s diverse array of Africa tours, including those in Egypt and Morocco, the company will donate $10 to UNICEF’s “Horn of Africa” program. As the tour makes its way from Cape Town to Livingstone, to its final stop at the renowned Victoria Falls, it takes in the semi-arid Kalahari Desert, the impressive Okavango River, and Augrables Falls National Park, home to the mighty Orange River and a remarkable gorge. Other highlights are the Namib Desert, which forms part of Africa’s largest game reserve, Naukluft National Park; Etosha National Park, a reserve and game sanctuary that houses blue wildebeest, zebra, giraffe, elephant and kubu; and a visit with the semi-nomadic Himba tribesmen. Pricing for the seven 2011 departures range from $4,889 to $5,039 per person; dates and pricing for 2012 departures will be available this fall. After a drive along the Atlantic seaboard and a cable car ride up the flat-topped Table Mountain, the group visits the historic town of Calvinia, nestled at the foot of the Hantam Mountains, and then travels through vibrant wine farms on the way to Augrabies Falls National Park. After admiring the “place of big noises,” as the falls were named by the Trek Boers, the trip spends two days each in Kgalagadi Transfrontier Park, where game drives allow for glimpses of the black mane lion, and the world’s second largest canyon, Fish River Canyon. Other stops include seeing the changing colors of the world’s highest sand dunes in Sesriem; spending time in Swakopmund, a seaside resort in northwestern Namibia; enjoying the spectacular mountaintop views in Damaraland; visiting the Himba tribe; and taking a game drive through Etosha National Park, home to thousands of African animals. Travelers can swim in the famous “river pool” of the Okavango River before crossing into Botswana for a game-viewing cruise on the Chobe River. The tour ends in Livingtstone with a visit to the dramatic Victoria Falls. An array of optional tours and activities allow guests to customize their South African adventure. In Swakopmund, there is the aerial view of the German colonial town from a hot air balloon or activities such as sandboarding, quad biking, skydiving and kayaking. 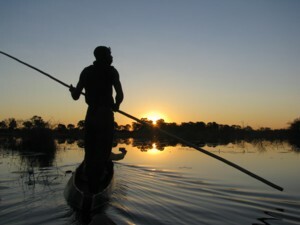 Bird walks, game drives and mokoro (canoe) excursions are all available during the two-day stay near the Okavango River. Adrenaline-infused options in Livingstone include white water rafting, bungee jumping, rhino walks, elephant back safaris, visits to Victoria Falls and airplane or helicopter flights. The tour package includes 20 nights’ lodge, chalet and small hotel/guest house accommodation; 21 breakfasts; professional tour guide; game drives, activities and park fees as specified in the itinerary; airport transfers: pick-up at Cape Town Airport, drop-off at Livingstone Airport; and transport throughout. International air, optional activities, drinks, meals not indicated within the itinerary, gratuities and visas are extra. A meal package including 13 buffet-style dinners can be pre-purchased for $449. Group size ranges from four to 16 participants. Booking information, brochures and reservations, can be obtained from travel agents or Adventure Center’s visitor-friendly web site, www.adventurecenter.com; or by phone: U.S. (800) 228-8747; Canada (866) 338-8735. Canadian travel agents needing bulk orders of brochures can order them at www.hippoexpress.com in Canada while U.S. agents should call Adventure Center. Loews Hotels is jump-starting the 2011 academic school year in partnership with Donorschoose.org, a web-based not-for-profit that enables individual donors to provide essential classroom tools for public schools in need. On Friday, August 19 each of the 16 American hotels will invite guests to visit the DonorsChoose.org school desk in the lobby to help allocate the hotel’s charitable funds to a classroom project of their choice. One hundred percent of the hotels’ funds—approximately $100,000— will be donated over the course of the day in communities across the country from New York City to San Diego. Public school teachers in the United States spent more than $1.33 billion out of pocket on school supplies and instructional materials in the 2009-2010 school year, according to researched released in June 2010 by the National School Supply and Equipment Association (NSSEA), a trade association for educational product companies. “We are thrilled with the tremendous support of Loews Hotels in helping teachers across the country acquire the materials and resources their students need in the classroom, especially at the start of the school year,” said Charles Best, CEO of DonorsChoose.org. In 2010, Loews Hotels celebrated the 20th anniversary of the Good Neighbor program by partnering with DonorsChoose.org in an effort to improve public education. Over the last year and a half, Loews’ team members have raised funds by organizing car washes, bake sales, golf tournaments and making individual donations to support education in their local communities. Loews Hotels impacted more than 60,000 students in 2010 with over $130,000 in donations. Founded in 2000, DonorsChoose.org (www.donorschoose.org) is a nonprofit website where public school teachers describe specific educational projects for their students, and donors can choose the projects they want to support. After completing a project, the donor hears back from the classroom they supported in the form of photographs and teacher thank-you letters. To date, 185,000 public and charter school teachers have used the site to secure funding for $85 million in books, art supplies, technology, and other resources that their students need to learn. Through DonorsChoose.org, individuals from all walks of life have helped 5 million students. Headquartered in New York City, Loews Hotels owns and/or operates 18 hotels and resorts in the U.S. and Canada, including the newest 414-room Loews Atlanta Hotel opened April 1, 2010. Located in major city centers and resort destinations from coast to coast, the Loews portfolio features one-of-a-kind properties that go beyond Four Diamond standards to delight guests with a supremely comfortable, uniquely local and vibrant travel experience. Loews boasts some of the industry’s most innovative and successful travel programs, including Loews Loves Kids for families and Loews Loves Pets for discerning animals on the road. For reservations or more information on Loews Hotels, call 1-800-23-LOEWS or check www.loewshotels.com. Follow Loews Hotels on Twitter: www.twitter.com/Loews_Hotels. Fan Loews Hotels on Facebook: www.facebook.com/LoewsHotels. OWN: Oprah Winfrey Network announced today the launch of an online sweepstakes at Oprah.com in support of the new series “Oprah’s Lifeclass,” formerly “OWN Your Life (the oprah class),” and its online companion course. Starting today, viewers can enter the sweepstakes for a chance to meet Oprah Winfrey at the O You! event in Atlanta, Georgia and reserve their spot for the online companion class at www.oprah.com/oprahslifeclass. The first one million people to sign up for the online class will be eligible to receive an exclusive, limited edition Oprah’s Lifeclass Journal, and can enter for the chance to meet Oprah in-person at the O You! event hosted by O, The Oprah Magazine. In addition, up to fifteen winners will receive an all expense paid trip to Atlanta to participate in O You!, where they will be the first students in Oprah’s class and join her on stage. OWN is partnering with Care2, Shine on Yahoo! and numerous Cable, Satellite and Telco distribution partners to reach the goal of one million students by October 10. Sixteen million viewers in the United States alone tuned in for “The Oprah Winfrey Show” finale. In the historic final hour, Oprah took the stage as teacher in the world’s biggest classroom highlighting the principles that guide her life, many of which were gleaned from the 4,561 hours of “The Oprah Winfrey Show.” In an all-new series, “Oprah’s Lifeclass” Oprah reaches back through the show’s 25 year history to teach the lessons that matter most to her… the guidelines for fulfilling your life’s potential, breaking through your barriers, understanding your purpose, letting go of anger, how to use joy to fuel your life, and becoming all you were meant to be. Oprah will share her most personal revelations, and what she thinks now about those iconic show moments and guests. “Oprah’s Lifeclass” will also have an online companion, Oprah’s Lifeclass, including actual course work on Oprah.com, for an even more enriching experience. “Oprah’s Lifeclass” premieres Monday, October 10 (8 p.m. ET/PT), and is produced by Harpo Productions. O You! will take place at the Georgia World Congress Center in Atlanta for a day dedicated to you and living your best life on Saturday, October 15. Every year, this full-day event brings Oprah fans from around the world together for a truly memorable day of learning, inspiration and fun. Attendees can participate in panels led by O, The Oprah Magazine contributors Suze Orman, Dr. Oz, Nate Berkus, Martha Beck, Donna Brazile, Peter Walsh, Bob Greene, Adam Glassman and Val Monroe. For event and ticket information, please visit www.oprah.com/oyou. CruiseOne, a cruise-only agency franchise company, is offering teachers – current, laid-off and retired – an opportunity to launch a new career path. A “Second Chance at Success” contest will provide five winners with the opportunity to start a new career as a CruiseOne franchise owner. To enter CruiseOne’s contest, current teachers, laid-off teachers or retired teachers (including teachers’ assistants and professors) must complete an online entry form by October 31, 2011. The form and all contest details can be found at www.SecondChanceAtSuccess.com or on CruiseOne’s Facebook page, www.Facebook.com/cruiseonefranchise. The five Grand Prize Winners will be announced by late-November, 2011. They will receive a free CruiseOne franchise including a waived $9,800 initial start-up fee, as well as one year of waived monthly service fees. Additionally, CruiseOne will bring the winners to its new state-of-the-art corporate headquarters in Fort Lauderdale, Florida, for six days of in-depth training. Winners will be reimbursed for their travel and provided with complimentary accommodations during the training program. Initial submissions will be judged by members of the CruiseOne network development, marketing and executive teams. Semi-Finalists will be selected after a phone interview, and asked to submit a resume, CruiseOne Franchise Application and a 1,200 to 2,200 CruiseOne Business Plan. For more information, visit www.SecondChanceatSuccess.com. The Berlin Wall was erected 50 years ago and ran 97 miles around the three western sectors of Berlin and 27 miles directly through the city’s center. In remembrance of the event, Context Travel is inaugurating a new walking seminar that traces the history of this monument while following part of the original route. The walk, led by a 20th century historian, investigates the post-war context of the Wall’s construction, the physical realities of life in the city that it divided, and the implications of its fall for a reunified Berlin. Walking the Wall is available daily for the price of 65 Euro per person, or 290 per private group. The walk, like all Context Travel walking seminars, will be capped at six participants and led by historians from the Context docent network. Founded by National Geographic writer Paul Bennett and graphic designer Lani Bevacqua, Context is a network of English-speaking scholars and professionals, including art historians, writers, architects and gastronomes, who organize and lead walking seminars in fifteen world cities, including: Florence, Rome, Venice, Naples, Paris, London, Madrid, Barcelona, Berlin, New York, Philadelphia, Boston, Washington, D.C., Istanbul, and Athens. Travel + Leisure has named Context one of the top European tour companies for its innovative approach to travel and the depth of its programs. To learn more about Context, visit its website at: www.contexttravel.com. City Sightseeing Pass operator the Leisure Pass Group has expanded into Germany with the launch of a Berlin Sightseeing Pass. The all inclusive card gives users access to 53 of the city’s leading tourist attractions, including notable favourites such as the Pergamon, The Jewish Museum and the Checkpoint Charlie Museum, as well as free access to the Berlin public transport network, a hop on hop off bus tour and a river cruise. Now in its 13th year of operation, Leisure Pass Group already runs successful sightseeing pass schemes in London, Paris and New York – as well as powering a host of similar programs in tourist hot-spots around the globe. “The Leisure Pass Group is well on its way to powering four million attraction visits every year, and the addition of the Berlin Sightseeing Pass really underlines our commitment to European expansion,” said Amanda Truman, director of product marketing, Leisure Pass Group. The Berlin City Card becomes the 11th sightseeing pass to operate on the Leisure Pass Group’s technology, the Leisure Pass Operating System. The system allows cash-less transactions at each attraction, and for individual venues to monitor card usage and numerous visitor information statistics. Other gems featured in the Berlin Sightseeing Pass include The Berliner Dom, Bode Museum and the Alte National Gallery, along with a Berlin Bus Tour and river cruise. The Berlin Sightseeing Pass is available in two- and three-day durations, and costs $98 for adults and $48 for children (two days) or $117 for adults and $55 for children (three days). Users also receive a 96-page city sightseeing guide. Passes must be ordered in advance of travel. 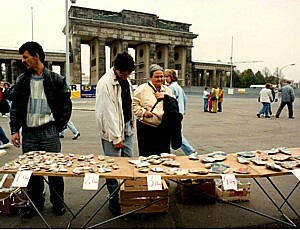 For more information and to buy, see www.berlinpass.com. One month after the terrorist attacks of September 11, 2001, the New-York Historical Society committed its resources to a new initiative called, History Responds, with exhibitions, public events and educational initiatives. Since then, the Society has presented 17 special exhibitions relating to the attacks, 20 public programs, five community meetings, numerous school and teacher programs and, when the Society’s newly-renovated headquarters reopens on November 11, 2011, a permanent installation of photographs and other materials donated by survivors, witnesses, and rescuers. To commemorate the tenth anniversary of September 11, the New-York Historical Society will present a special exhibition, Remembering 9/11, which will be free to the public. The exhibition opens on September 8, 2011 and will remain on view through April 1, 2012. The exhibition presents a selection of several hundred photographs taken by professional and amateur photographers in the immediate aftermath of the attack on the World Trade Center (originally collected in the independent exhibition “here is new york: a democracy of photographs”), as well as letters written to policemen and firemen; objects that were placed in makeshift shrines around New York; images and texts from the New York Times “Portraits of Grief” series; photographs of the Tribute in Light; and drawings of the National September 11 Memorial, designed by architect Michael Arad with the assistance of landscape architect Peter Walker. As a special presentation for families, the Historical Society will also host a free reading by Vin Panaro, Bugler for the Fire Department of New York, and Katie Fuller, Museum Educator, of Maira Kalman’s book Fireboat, to be held in the Rotunda from 11:30 a.m. to 12:30 p.m. on Sunday, September 11, 2011. 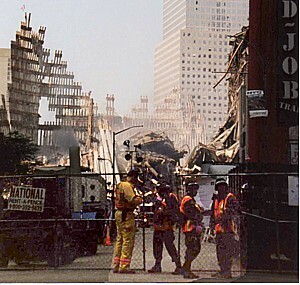 Remembering 9/11 is organized for the New-York Historical Society by Marilyn Satin Kushner, Curator and Head, Department of Prints, Photographs and Architectural Collections. “I wanted to create a space where people could come to quietly remember those days in 2001 and honor the memories of the people who were lost in the attacks. The solemnity of this occasion calls for a mood of respect and introspection,” stated Dr. Kushner. When the renovated and transformed New-York Historical Society opens fully to the public on November 11, 2011, Remembering 9/11 will be joined by a permanent installation of photographs from “here is new york” in the Robert H. and Clarice Smith New York Gallery of American History. Approximately 1,500 photographs by 790 contributors will be on display, along with a large fragment of a fire truck destroyed during the 9/11 attack. Since the inception of the Historical Society’s History Responds, more than 150,000 visitors have taken part in its interpretive programs. Today, the History Responds collection includes numerous artifacts associated with September 11, ranging from architectural relics of the Twin Towers to artworks inspired by the catastrophe. Founded in 1804, the Historical Society has a mission to explore the richly layered political, cultural, and social history of New York City and State and the nation and to serve as a national forum for the discussion of issues surrounding the making and meaning of history. The New-York Historical Society is located at 2 West 77th Street (across the street from the American Museum of Natural History), 212-873-3400, www.nyhistory.org. Ultraluxe Crystal Cruises is encouraging family and friends to celebrate the festive traditions of the 2011 holiday season together with a sweetened Crystal Family Memories program for Hanukkah, Christmas and New Year’s holiday travel. The “Pacific Coast Holiday” visits tropical favorites Lahaina, Maui; Honolulu, Oahu; Nawiliwili, Kaui; Hilo, Hawaii; and Enseñada, Mexico. Christmas and New Year’s holidays will be celebrated at sea with opulent, all-ship soirees, complete with fresh mixologist-made cocktails, premium wines and champagne, gourmet cuisine, and live entertainment and dancing. Christian and Jewish clergy will host Christmas and Hanukkah services, and Junior Activities Directors will lead children and teens in custom-crafted activities daily. Two-for-One fares for the 14-day cruise begin at $7,050 per person, and include $500/person “All Inclusive. As You Wish” shipboard credit, plus free, round-trip air and airport transfer from two dozen North American gateway cities (or generous air credit). Groups of six must sail together in a minimum of three staterooms; other restrictions apply. The Rosen Shingle Creek has teamed up with SeaWorld Orlando to present the “Sea the World” package – a fun family getaway for four including deluxe accommodations at the AAA Four Diamond hotel and SeaWorld Orlando tickets. The “Sea the World” package is available for $500 (including tax, gratuities not included). The offer is valid for any two consecutive nights from Aug. 5-9, 13-16, 19-28, or Aug. 31-Sept. 6, based on availability. To book, call 866-996-6338 or visit www.rosenshinglecreek.com. SeaWorld Orlando tickets are valid for one year within date of purchase. The second day free is valid for one additional visit at no additional charge for up to seven consecutive days from the date of the first visit. Tickets are non-transferable and non-refundable; offer is not valid with other offers or discounts. Guests may enjoy their twenty-five percent dining discount at any of Rosen Shingle Creek’s 14 restaurants and lounges, including two recently opened options: Banrai Sushi sushi bar and Tobias Flats & Watering Hole, serving a variety of flatbread-based dishes. Two of the hotel’s restaurants have earned the prestigious AAA Four Diamond rating: A Land Remembered, which proudly serves Harris Ranch All Natural Black Angus Beef, and the upscale Cala Bella “Beautiful Creek” Italian bistro, which offers a presentation bar for “ringside” views of its culinary artists at work. For some relaxing downtime away from the theme parks, guests may enjoy 18 holes of championship golf at Shingle Creek Golf Club or indulge in an afternoon of pampering at The Spa at Shingle Creek. Four swimming pools, a game room and a host of other amenities offer something for every member of the family. While at SeaWorld, guests can take in the new “One Ocean” Shamu show, featuring killer whales as ambassadors of the sea and the ocean as the center of the natural world. At the core of the show is the inspiring and educational message that both animals and humans are part of one world, with one ocean. For more information, visit www.seaworldorlando.com. The AAA Four Diamond, 1,500-room Rosen Shingle Creek is conveniently located at 9939 Universal Blvd., just off the International Drive tourist district and ten minutes from the Orlando International Airport. Among the many honors the hotel has been awarded are Meetings & Conventions (M&C) magazine’s Gold Platter Award, a “best of the best” award which is given only to the top catering departments at convention properties across the country. To book a room, guests may call the Rosen Shingle Creek reservations line at (866) 996-6338. For more information, visit www.rosenshinglecreek.com or call (866) 996-9939. 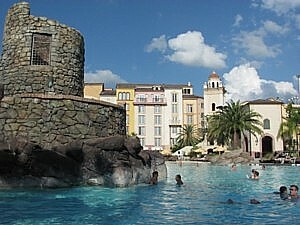 For more information about Rosen Hotels & Resorts, visit www.rosenhotels.com. Pacific-Coast-Highway-Travel.com has just released its comprehensive iPhone app with hand-picked accommodation suggestions and reviews for all along the Pacific Coast Highway from Seattle to San Diego. The app is available immediately in the iTunes App Store for the introductory price of $0.99, and can be downloaded from http://www.guidegecko.com/pchh-app.html. To celebrate the launch, one lucky person is about to win a free night in Carmel – or maybe even two. The winner (and one guest, sharing the room) will receive one free night at the writers’ favorite inn along the Pacific Coast Highway: the beautiful Vagabond’s House Inn in romantic Carmel. If you travel between January and March 2012, the Inn will throw in a second night as part of the prize. The competition runs until 31st August 2011. To participate, answer three simple questions on http://www.guidegecko.com/contest/c,193, the information for which is all contained in the app. The app includes over 200 hand-picked accommodation options ranging from guesthouses to inns and hotels, with many historic and unusual choices at various price ranges. A bonus section on California Wine Country is also included. All reviews are written by award-winning travel writers Mike Gerrard and Donna Dailey. The app also features photos for every hotel as well as offline maps to save on roaming charges for international visitors. More on the contest can be found at http://www.guidegecko.com/contest/c,193, the app can be downloaded at http://www.guidegecko.com/pchh-app.html. Pacific-Coast-Highway-Travel.com (www.Pacific-Coast-Highway-Travel.com) is a leading online resource to the Pacific Coast Highway, written by award-winning travel writers Mike Gerrard and Donna Dailey. “It was surprisingly easy to produce the app. We worked with the clever guys at GuideGecko, whose technical wizardry took our book and, once we’d found photos for all the hotels, turned it into an app at the push of a button.” says Mike Gerrard, co-owner of Pacific-Coast-Highway-Travel.com. “It took just 7 weeks from the first email to the app appearing in the Apple Store”, he adds. GuideGecko is a leading publishing platform for travel guides, offering more than 2700 guidebooks on 169 countries and 270 cities and regions around the world. GuideGecko publishes worldwide travel guides for the iPhone, Amazon Kindle and on the web. All guides are independently researched and written by professional travel writers from around the world.